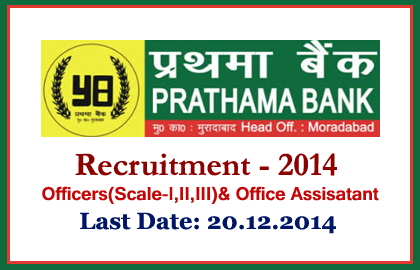 Prathama Bank has announced recruitment for the post of Officers and Office Assistant. Candidates those who are qualified in RRBs CWE –III conducted by IBPS in September/October 2014 can apply for this post on or before 20.12.2014. More details regarding this recruitment were mentioned below. Candidates those who cleared the RRBs CWE-III were considered as the eligible person and required marks details that had obtained were mention in the link given below. Candidates will be selected on the basis of the marks scored in the RRBs CWE-III conducted in Sep/Oct 2014 by IBPS and Personal Interview. Eligible candidates can apply for this post by clicking the link given below or through the banks website:www.prathamabank.org . After completing the online registration, application fee had to be paid. You can pay your application fees by filling the challan that you can download from the link given below or through the bank website. Using the fees payment challan candidates can pay the application fee in the any of the Prathama Bank. Account No. 89025174900.